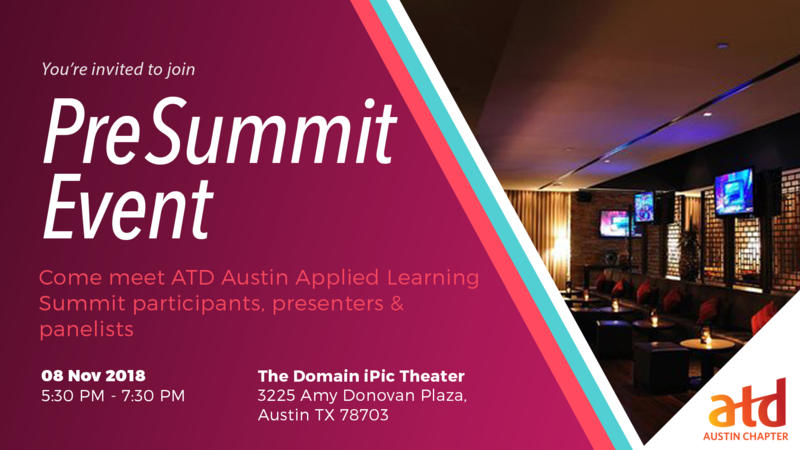 The First ATD Austin Applied Learning Summit is picking up steam and you don't want to miss it! BUY 3 Get 1 FREE! Offer ends November 8th!!! This annual Summit naturally emerged from the Leaders in Learning Awards because of ATD Austin’s commitment to excellence in talent development. The event challenges individual contributors to build and share projects that successfully use learning as a strategic business tool for all organizations. The annual Applied Learning Summit 2018 will host attendees, speakers, sponsors, and exhibitors at the Mueller Alamo Drafthouse, a stimulating environment for new business connections. Top nominees will showcase their remarkable work, share lessons learned, and provide application strategies with the highest honors going to innovative concepts, processes, and tools that advance human development, enhance organizational performance, and increase profits. Registration includes.. Attendance to all sessions, morning mixer, breakfast, lunch, beverage breaks, door prizes, PLUS, FREE attendance to the November 8th social for an evening of networking, fun, and food at the luxurious Lounge, at the Domain!!! We're excited and look forward to meeting you there!